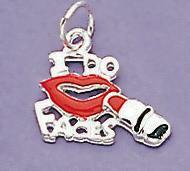 Money Bag Charm in Gold or Silver with embossed dollar sign. Made in the USA. Please specify color when ordering. Gold is temporarily out of stock. PLEASE SEE CH161.